Wellness® recently introduced additions to their Complete Health™ line to include Grain Free options in their baseline product. This is helping introduce pet owners to Grain Free from their very first purchase of Wellness Products. This is one of those things that it so important to your dog and their overall health. We often hear the phrase about our foods that, “You are what you eat.” I believe that is also true for your dog. We cannot expect our dogs to be healthy and active if we are not feeding them the proper nutrition that they need. Since finding Wellness Complete Health Grain Free dog food for our dog Bella, I have been impressed with how much better she is as a whole. She has no itching, she has less dander, not as much shedding, and she is happy and active. We are so glad to say #GrainFreeForMe! Can we talk about the main thing that I notice with her? Her stools are amazing, (I know it sounds odd to even write that) but, we don’t have piles and piles in our yard anymore. When we were uneducated and feeding our dog a big box store brand of dog food I have to tell you that it was an awful thing to get caught on clean up duty for this girl. She never had consistent stools, it was sometimes runny, sometimes difficult to pass, it was large at times and other times small. That to me is a huge indicator in the health of your dog. I don’t like to clean up my dog’s stool but, I will tell you I don’t mind since we made the switch. 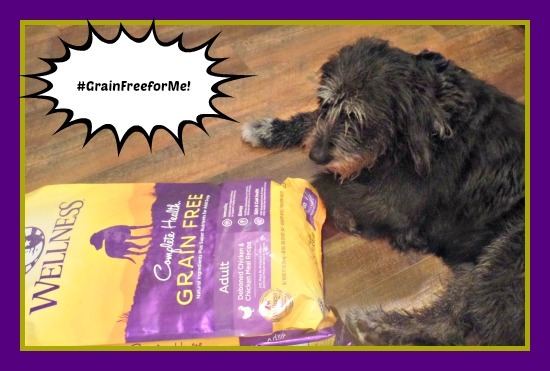 If pet parents try this Wellness Grain Free, and learn that the clean up of their dog is so much easier and better for their dog they will be shouting from the rooftops, #GrainFreeForMe! I know I am. We as humans need good food to keep us healthy and in top shape; our dogs are not different. They need foods that contain “more of the good stuff”, and Wellness grain free recipes gives them that, from chickpeas, flaxseed, carrots, sweet potatoes all the way to apples and blueberries. They are getting more protein, vitamins, and nutrients just from eating a food they love! Your writing is so fresh and wonderful! Your great wit shines thru ! I’m so proud of you! Thank you so much for the nice thought! !